Successfully Added iPhone Battery Charger - Holder with Stereo Speakers to your Shopping Cart. Revealing the 3-in-1 iPhone charger + holder with twin stereo speakers. Designed for the iPhone 2G, 3G and 3Gs and comes with twin speakers which increases the audio output from your iPhone 5x over. This iPhone holder and charger with stereo speakers is built with a genuine Italian leather flip cover, Hard molded ABS body that houses an 1800mAh li-ion polymer battery that provides you with extra power for extra convenience. The best feature of this portable iPhone charger and holder is the Sync capability, there is no need to take your iPhone out and connect it to your computer, just leave it encased in the iPhone portable charger and connect the iPhone portable charger & holder to your laptop computer. Another great feature is the twin stereo speakers located at the back of this portable iPhone holder and charger. This feature increases the volume of your iPhone 5 times (5x). But lets not forget the main function of this iPhone portable charger, that’s is, to provide you with extra power when needed! 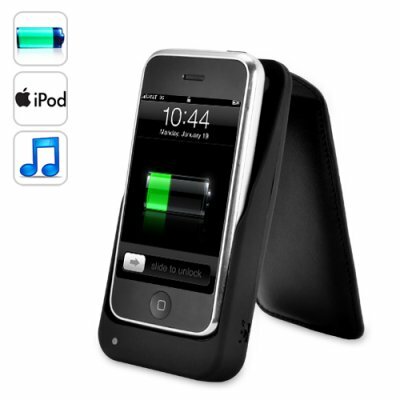 This ergonomically designed iPhone holder & charger with stereo speakers is in stock now. Click "Add to Cart" now and we'll ship you a sample to see for your self how amazing this 3-in-1 iPhone charger + holder with twin speakers truly is. This cool iPhone gadget is brought to you by the leaders in consumer electronic products, Chinavasion. Is this iPhone holder and charger with stereo speakers compatible with the iPod? This iPhone battery charger with stereo speakers is only designed to be used with the iPhone 2G, 3G and 3GS. Note: the iPhone 3G and 3Gs are compatible with this item, but due to their size, they fit tighter than an iPhone 2G. Can I charge my iPhone while listening to music through the stereo speakers simultaneously? very smart item and it works perfectly,as for the delivery really fast, keep up the good job.